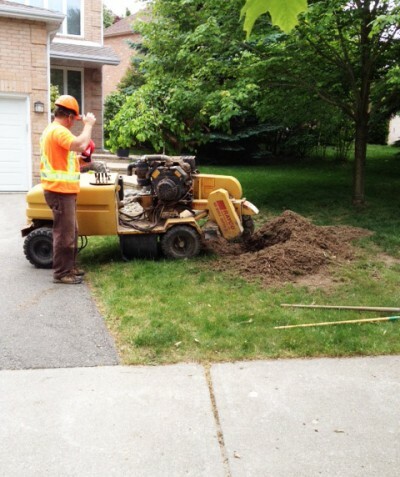 Stump removal or grinding typically follows when a tree has been removed. Most property owners do not want an ugly stump in the yard or landscape. They invite insects, such as ants, beetles, wasps, bees, etc., which can make the entire around surrounding the stump dangerous to your children and pets. Instead, call Cedar Rapids Tree Service for a fast, free estimate to have that tree stump ground or removed entirely. Believe it or not, but having a stump ground down or removed entirely is likely the cheapest option you have. We have know homeowners that have used stumps for planters or hired expensive artists to make a chainsaw carving out of it. However, comparatively speaking the cost of having it removed our ground is almost always a cheaper option. However, only you can decide what is best for your yard or landscape; however, most property owners opt to have the stump removed immediately after the tree has been cut down. Which One - Stump Removal or Grinding? Some quantity of backfill will be required to fill in the hole left by the removed stump and roots. Requires a stump grinding be brought on to your property (however it will be less impactful than a backhoe). Will cause damage to the surrounding area, and even to nearby landscaping. The stump is not entirely removed, so it is not suitable is foundation work needs to be done in the area. Depending on the type (different species of tree vary in there difficulty to remove/grind), size, and the age of your tree, either removal or grinding may be best for the application. Our knowledgeable staff will help you decide what is best for both your landscape and your wallet. Treat your property unprofessionally and not clean-up during and after the job. Both stump removal and grinding require the use of specific equipment. As you consider tree care providers, do your best to ascertain that they possess and can efficiently/safely operate this equipment. While it doesn't happen often, damage to nearby landscaping and even property structures can occur when inexperienced operators misuse this equipment. With Cedar Rapids Tree Service you can be assured we have the experience and skill to operate backhoes and stump grinders professionally. We offer discounts on multiple stump removals or grinding, and specials on purchasing multiple tree services from us, such as tree removal or brushing.